A heartfelt thanks from all of us at Surrey Police Band to every single person who was part of such a wonderful evening last night at our Christmas Concert. To our musicians who put on an outstanding performance, to all our wonderful volunteers who helped to stage such a smooth running show, to our fabulous committee, especially our Chair Rachel, who has spent many hours considering every last detail, and to our wonderful conductor Graham for putting together such a magical programme to wow our full and appreciative audience. We really couldn’t have asked for more! The sell out evening opened with ‘A Proclamation of Christmas’ and flowed wonderfully through a variety of pieces, from traditional Christmas carols, as well as festive favourites such as Sleigh Ride and A Christmas Festival, through to film excerpts from Frozen and The Polar Express, accommodating for all the family! Our famous home made cakes, with the festive addition of mince pies and mulled wine, made for a tasty and atmospheric interval. The second half was kicked off by our raffle, which featured an array of fantastic prizes kindly donated by local companies. We were delighted to be able to present a cheque for £1,000 to Chris Major of The Children’s Trust, our fundraising total from the band’s previous three concerts. Younger members of the audience were invited to join in on various percussion instruments during Troika, and the evening was topped off with a surprise visit from Father Christmas, who was feeling very generous this year as he handed out presents to members of the audience. 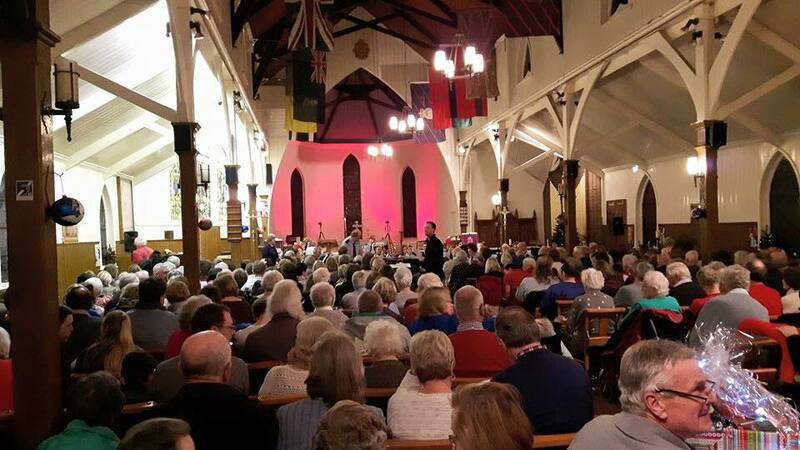 Thank you to everyone who came along and supported – what a wonderful evening which we hope left our audience members in the Christmas spirit. If you missed out on a ticket this year, be sure to book well in advance for next year’s concert! We wish you a very Merry Christmas and look forward to seeing you all in 2016. Our sell out Christmas Concert audience ready to get in the festive spirit!